Nobody laughed a few years ago when former governor Bob McDonnell dubbed Virginia the “Energy Capital of the East Coast”; we were all too astounded by the hyperbole. And today, even “Energy Suburb” still seems like a stretch. Yet, if you measure achievement by the sheer level of activity, Virginia is making a play for importance. The year’s top energy stories show us fully engaged in the worldwide battle between fossil fuels and renewable energy. Of course, while the smart money says renewables will dominate by mid-century, Virginia seems determined to drown rather than give up its fossil fuel addiction. Coal falls hard; observers disagree on whether it bounces or goes splat. Nationwide, 2014 was a bad year for the coal industry. Coal stocks fell precipitously; mining jobs continued to decline; and the one thing electric utilities and the public found to agree on is that no one likes coal. Even in Virginia, with its long history of mining, coal had to play defense for what may have been the first time ever. So when Governor McAuliffe released the state’s latest energy plan in October, what was otherwise a paean to “All of the Above” omitted the stanza on coal. And this month, the governor proposed a rollback of the subsidies coal companies pocket by mining Virginia coal. Of course, coal is not going quietly; Senator Charles Carrico (himself heavily subsidized by Alpha Natural Resources) has already responded with a bill to extend the subsidies to 2022. EPA opens a door to a cleaner future, and Republicans try to brick it up. Speaking of hard times for coal, in June the EPA unveiled its proposal to lower carbon emissions from existing power plants 30% nationwide by 2030. Instead of targeting plants one-by-one, EPA proposed a systemic approach, offering a suite of options for states to reach their individualized targets. 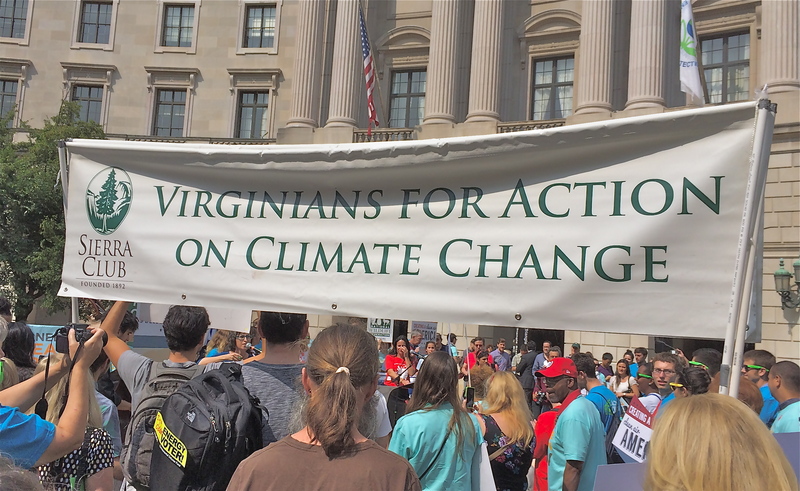 The proposal drew widespread support from the public, but Virginia’s 38% reduction target set off howls of protest from defenders of the status quo. The staff of the State Corporation Commission claimed the rule was illegal and would cost ratepayers $6 billion. Republicans convened a special meeting of the House and Senate Energy and Commerce Committees, where they tried out a number of arguments, not all of which proved ready for prime time. The rule, they said, threatens Virginia with a loss of business to more favored states like—and I am not making this up—West Virginia. Also, Virginia should have received more credit for lowering its carbon emissions by building nuclear plants back in the 1970s when no one was thinking about carbon emissions. Meanwhile, the Southern Environmental Law Center analyzed the rule and concluded that actually, compliance will not be hard. Virginia is already 80% of the way there, and achieving the rest will produce a burst of clean-energy jobs coupled with savings for consumers through energy efficiency. Undaunted, Republicans have already introduced a thumb-your-nose-at-EPA bill developed by the fossil fuel champions at the American Legislative Exchange Council. The “solarize” movement takes Virginia by storm. For the last few years, solar energy has been exploding in popularity across the U.S., but Virginia always seemed to be missing the party. So it surprised even advocates this year when pent-up consumer demand manifested itself in the blossoming of local solar buying cooperatives and other bulk-purchase arrangements. “Solarize Blacksburg” made its debut in March, going on to sign up hundreds of homeowners for solar installations. It was followed in quick succession by the launch of similar programs in Richmond, Charlottesville, Harrisonburg, Northern Virginia, Halifax, Floyd, and Hampton Roads. The main reason for the solarize programs’ success was the steep decline in the cost of solar energy. 2014 saw the cost of residential installations in Virginia fall to record low prices, making the investment worthwhile to a broad swath of homeowners for the first time. Utilities say maybe to solar, but only for themselves. Virginia still boasts no utility-scale solar, but utilities elsewhere signed long-term power purchase contracts for solar energy at prices that were sometimes below that of natural gas: under 6.5 cents/kilowatt-hour in Georgia, and under 5 cents in Texas. Compare that to the estimated 9.3 cents/kWh cost of power from Dominion Virginia Power’s newest and most up-to-date coal plant, the Virginia City Hybrid Energy Plant, and you’ll understand why Dominion has suddenly taken an interest in solar projects. Sadly, it’s own foray into rooftop solar so far stands as an example of what not to do, and a testament to why the private market should be allowed to compete. Yet Virginia utilities continued their hostility to customer-owned solar. Dominion put the kibosh on a bill that would have expanded access to solar energy through community net-metering, while Appalachian Power matched Dominion’s earlier success in imposing punitive standby charges on owners of larger residential systems. Fracking, pipelines, and gas plants, oh my! Renewable energy may be the future, but the present belongs to cheap natural gas. Yes, the fracking process is dirty, noisy and polluting, and yes, methane leakage around gas wells is exacerbating climate change. But did we mention gas is cheap? 2014 saw proposals to drill gas wells east of I-95, while the Virginia government began updating its regulations to govern fracking. Dominion Power started construction on a second new gas power plant, and talked up its plans for a third. The utility giant, a major player in the gas transmission business, also got approval to turn its liquefied natural gas import terminal in Cove Point, Maryland, into an export terminal. With visions of customers dancing in its head, it also announced plans for a major new pipeline to bring fracked gas from West Virginia through Virginia and into North Carolina—one of three proposed pipelines that would cut through the Virginia countryside and across natural treasures like the Appalachian Trail. The pipeline created an instant protest movement but gained the wholehearted approval of Governor McAuliffe. Flooding in Hampton Roads becomes the new normal; it’s still not okay to ask what’s causing it. A cooler-than-normal year for the eastern United States gulled many landlubbers into believing that global warming was taking a breather, but meanwhile the ocean continued its inexorable rise along Virginia’s vulnerable coastline. It’s one thing to shrug off the occasional storm, said residents; it’s harder to ignore seawater that cuts off your parking lot at every high tide. 2014 will go down as the year everyone finally agreed we have a problem—even in the General Assembly, which passed legislation to develop a response to the “recurrent flooding.” But while the bill recognized that the problem will just get worse, it avoided noting why. Public corruption: in Virginia, it’s not just for politicians. Everyone can agree that it was a really bad year for the Virginia Way, that gentlemanly notion that persons of good character don’t need no stinkin’ ethics laws. But we also saw plenty to prove the adage that the real scandal is what’s legal. As we learned, Virginia law allows unlimited corporate contributions to campaigns, and puts no limits on what campaigns can spend money on. So if some legislators act more like corporate employees than servants of the public, well, that’s how the system was set up to work. So as we look ahead to 2015’s energy battles, anyone wondering who the winners and losers will be needs only one piece of guidance: in Virginia, just follow the money. This entry was posted in climate change, coal, legislation, natural gas, Renewable energy, Solar and tagged APCo, Bob McDonnell, Clean Power Plan, coal, Dominion Resources, Dominion Virginia Power, natural gas, sea level rise, SELC, solar energy, solarize, Virginia. Bookmark the permalink.